A lock is a device used to restrict access to an area or enclosure. It is the duty of the lock to restrict access until the correct key or combination is used to operate the lock. Most modern locks are a combination of a cylinder and a bolt. There several major types of locks with many high security locks being hybrid designs. A pin-tumbler based design with pins arranged in a circle and accessible from the face of the lock. A keyless lock that uses numbers, letters, or symbols for input. A specific combination of input properly aligns internal components so that the lock can be opened. Most commonly associated with safes or combination padlocks. Combination locks range from low to high security. A pin-tumbler based design that uses a horizontal keyway rather than the traditional vertical style. High-security dimple locks have various security features that most traditional pin-tumblers don't. Namely, the use of telescoping pins. Uses flat metal tumblers that interface with a sidebar to prevent rotation of the plug. Separate from wafer designs because discs are usually rotated rather than lifted. A lock that is operated via electronic means. Electronic locks may incorporate various digital access control features, such as biometrics. Electronic locks usually provide advanced auditing and key control capabilities, but generally are not any more secure than traditional locks. Many electronic locks are also combination locks. Hybrid locks encompass combinations of all lock designs. Many modern high security locks are hybrid designs. Uses flat metal tumblers (levers) with a gate. Lever locks range from low to high security. One of the oldest lock types, next to warded. Uses magnetism to properly position components. Most magnetic locks use the tradtional plug/cylinder arrangement with magnetic components blocking the shear line. Magnetic locks can vary from low to high security. Uses moving pins to prevent rotation of the plug. Pin-tumbler locks range from low to high security. Dimple and axial/tubular locks are simply pin-tumblers with modified designs. Currently the most popular lock design worldwide. Uses flat metal tumblers to prevent rotation of the plug. Wafer locks range from low to high security, with the vast majority of wafer locks being low security. Uses internal wards to obstruct the rotation of incorrect keys. One of the oldest lock designs, but provides minimal security by modern standards. A lock that uses the cam or actuator as the bolt mechanism. 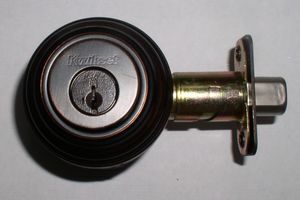 A lock that uses a rotating cylinder to actuate the locking bolt. A lock that uses a self-recessed bolt or shackle and is not mounted to a door or wall. Many padlocks use a cylinder-based lock design. Security of locks can be compromised many ways, depending on the type, manufacturer and model, and the installation and maintenance details of a target lock. The practice of compromising locks as a hobby is known as locksport. Internal components are manipulated to allow the lock to be opened. The non-cylinder portions of the lock are attacked, such as the locking bolt or the actuator. A working key is duplicated or internal components are manipulated to provide a working key. The proper position of internal components is decoded via examination of the key or manipulation of internal components. Destruction of or damage to the lock or surrounding materials, such as a door or wall. Also known as forced entry. The proper key or combination is foricbly obtained from authorized users by threatening or inflicting physical or emotional harm. The proper key or combination is obtained via theft, impersonation, blackmail, or fraud.